Arriving earlier than expected, Sega announced today that rhythm game Hatsune Miku: Project Diva X is releasing on August 30 in North America and South America for PlayStation 4 and PlayStation Vita. Unlike the Japan release, the PS4 version won’t include ‘HD’ in the title in the Americas. Additionally, a free update after the launch of PlayStation VR will enable VR support for the Concert Editor’s Live View mode. Hatsune Miku is back and bigger than ever on the PlayStation 4 and PlayStation Vita in the upcoming rhythm game, Hatsune Miku: Project DIVA X. For those new to Project DIVA, it is an addictive core rhythm game starring the digital singer, Hatsune Miku. 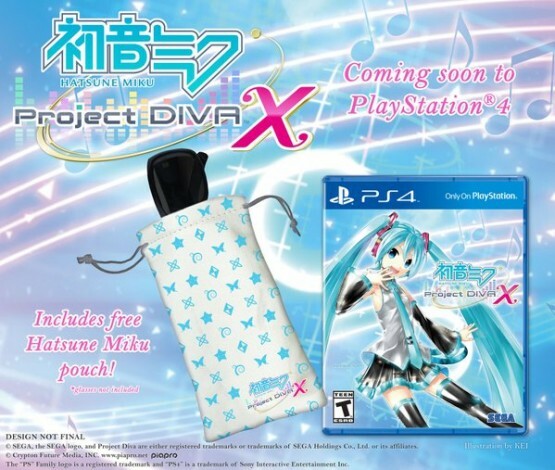 Project DIVA X is driven forward though a narrative in which centers on Miku and her friends undertaking various requests as they explore the five Clouds that make up their world. For the Miku veterans, Project DIVA X has 30 songs and nearly 300 modules (costumes) that get dropped. Interact with Miku and Her Friends – Things start to get very meta for the digital singer as she and her friends discover what it’s like to live in the world of Project DIVA X – players can interact and with the characters. Sega didn’t have any details on a European release date today. You can read our Vita import review over here.